Tarr’s is a heavy, maximalist vision, as ambitiously difficult as it is endlessly generous to the spectator willing to fully enter its embrace. Grand effect is most often the product of grand effort, and The Man from London, Tarr’s long-awaited follow-up to Werckmeister, arrives laden with a creation story marred by the suicide of a key producer, funding issues, massive investment in production infrastructure, and interminable delays. Almost as if to thumb his nose at the earthly concerns that bind the realization of his decidedly unearthly vision, Tarr launches his latest by transcending physicality altogether. It may not be an exaggeration to say that The Man from London opens with one of cinema’s great first shots, a nearly twelve-minute slow-burn that begins by recasting the prow of a large ship as a series of unimaginably beautiful and mysterious planar abstractions, then, in its continued movement upwards to the sky collapses and confuses our relationship to the objects and spaces around the ship, all to finally, abruptly shove us into the meat of Tarr’s noir narrative via sudden alignment with the viewpoint of lonely dockworker Maloin (Miroslav Krobot), who witnesses a clandestine business transaction that leads to murder. Though it does contain story elements, the shot is more valuable (and commanding) for reminding us of the powers of the medium: in Tarr’s complicated, inevitable cinematographic gymnastics we find potential actualized in the form of a brooding black-and-white meditation on cinema itself. As a filmmaker Tarr simply views the possibilities of space differently, and his magic as an artist lies in his success at forcing audiences to look like he does. If the rest of The Man from London isn’t quite as stunning as its opening, it’s almost no matter—you’ll have already sat through nearly ten percent of the film’s length by the time the shot ends. Noting that this one part of The Man from London so fully overshadows the whole is in no way to suggest that there’s really much wrong here at all. But this is also not to suggest that it scales the giddy heights of Werckmeister Harmonies or Sátántangó either. Most problematic is the thinness of the source novel by Georges Simenon (extraordinarily prolific, widely translated, and as such, an odd choice for such a director so accustomed to working hermetically with the same small team of collaborators) when paired with the lugubrious inexorability of Tarr’s cinema. A very simple tale of a murder, a suitcase filled with currency, and various persons jockeying for control of the cash, The Man from London feels at times like a waste of a cinematic talent more famous for its detours into a highly unique brand of Eastern European (meta)physical squalor. Lacking the grandiose gestures and unique vision of longtime screenwriter László Krasznahorkai (who did assist in the adaptation) that conjured a dead whale in a truck, or a young girl penitently euthanizing her cat and herself with arsenic, The Man from London feels somehow smaller than Sátántangó or Werckmeister Harmonies, but the film’s more obvious negative attributes can be misleading. One shouldn’t walk into a Béla Tarr film expecting to leave and have a heated discussion about the dialogue or plot points. His choice of material may be disappointing, but Tarr’s still brought the full force of his cinema to bear in translating it to the screen. If the generally concrete tale of Maloin, head of a miserablist clan that includes his unnamed wife (Tilda Swinton, remarkably credible amongst Tarr’s cast of now-familiar Eastern European malcontents) and teenaged daughter Hannah (Erika Bók) and the various powers searching for the case of money left adrift in the opening sequence, allows little room for the kinds of flights of imagination that mark his other great films as such, Béla Tarr the filmmaker, meditative as he is, seems little interested in truly ratcheting the underlying tensions of a narrative that could easily have been replayed as the Hungarian cousin to Sam Raimi’s A Simple Plan. This reluctance (or recalcitrance) results in a strange kind of elevation—we’re unused to seeing a thriller unfold at this pace; not unlike the manner in which the sexual power play in Damnation slowly grounds itself out over two hours, The Man from London certainly takes its time going through its motions. Some of the film’s detours recall his best moments: a pan from a tense interrogation about the missing case that reveals a pack of drunks balancing billiard balls on their heads references the opening celestial bodies sequence of Werckmeister; a side narrative in which Maloin sorts out his daughter’s employment at a local grocer with its harridan of an owner helps ground the film in the universe for which Tarr is more well-known. Technically perfect (minus Míhaly Víg’s whirring and clicking score, which grates), The Man from London is so beautiful and carefully made a film it portends of those aesthetic losses we’ll suffer as digital filmmaking continues its steady encroachment. Variety, host to an ever-reliable film reviewing department (tyro helmer should score boffo b.o.! ), describes The Man from London as “good but not great Tarr.” Apt, but this omits the fact that great Tarr is truly the best of cinema. If we are to deal with Tarr that’s merely “good,” it should be acknowledged that even on this level he remains better than almost anyone else. There are only a handful of filmmakers working today who make each camera movement resonate with the force of true meaning (Olivier Assayas and Hou Hsiao-hsien come immediately to mind), and Tarr is most certainly one of them, if not the best of the bunch. Each of his stark black-and-white images reeks of the true consideration we ask of any visual artist, and that Tarr has chosen to apply his formidable talents to questionable material is almost beside the point. 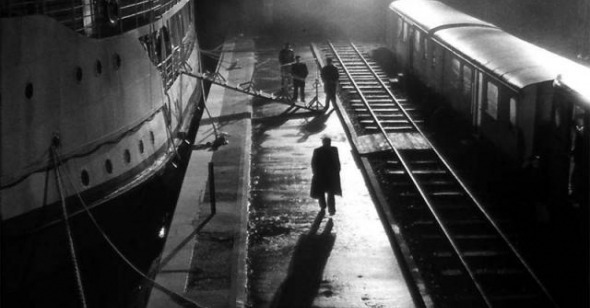 If Simenon’s novel may seem unworthy of further attention after watching The Man from London, we cinephiles should be grateful that it inspired such a formidable filmmaker to go back to work. As much a Tarr fan as I am, if I do have reservations about The Man from London in relation to his other films, they’re generally small. No, The Man from London isn’t Werckmeister Harmonies or Sátántangó, but it doesn’t need, nor want to be. It’s a Béla Tarr film, and that’s more than enough.